Adding the Q&A solution to your website. Before making purchases, clients often search for feedback and reviews before making purchases. 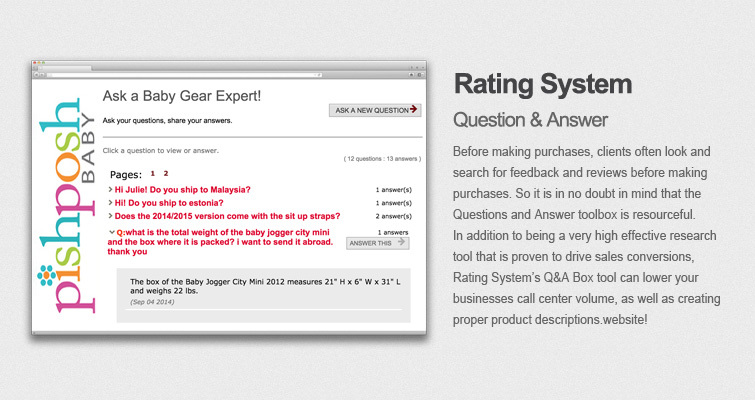 With this in mind, the Questions and Answer function is useful tool. In addition to being a very high effective research tool that is proven to drive sales conversions, Rating System’s Q&A function can lower your businesses call center volume by providing a customer based self-service function. Lower your call center volume: By providingcustomer generated answers to product questions, inbound call center volume will decrease, all with the help of your customers. When the information is shared (or answered) and most importantly, trusted,, the customer doesn’t feel the need to contact the company to ask questions that could have been already be answered. Your products’ descriptions: At times, it could get very hard to place the right description on your products to drive customers to buy it. After a short period of usage of our Q&A feature, the site is able to gather the most important and useful information throughout the history of commonly asked questions. Presentation of your product is very important, and having a proper description can help you and your customers come to a quicker buyers conclusion! It's a completely hosted. No software to install. Integration with your current authentication system. You own all your questions and answer content. You are always in control. You can manage, modify and delete your customer questions and answers. Customizable styles - colors, layouts, and graphics. Instant Email Notifications when new content is posted. Abusive words filter to automatically filter content. Spammer IP filter reduces junk.